Looking for some fun dancing robots? Of course you are! Look no further than Wicked jackpots! Play Tin Town Slots, with fun dancing robots, as well as Scatter, Wilds, FREE spins and more! Check it out for yourself today. 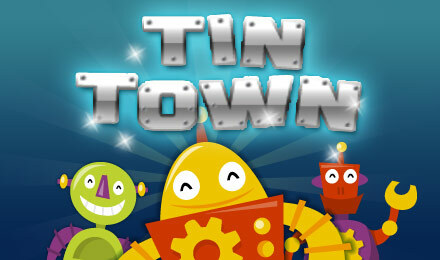 Tin Town is a fun slot game with a retro feel and a robot theme. The reels are filled with various robotic symbols, such as batteries, UFOs and springs, just to name a few. Spin 3 or more Dogbots to activate your FREE spins round, which can be re-triggered for even more chances to win! The blue Dancebot is the Wild symbol, and can take the place of any symbol except for the Dogbot. Spin 5 of them to trigger the max jackpot! There are loads of chances to win and loads of fun to be had! Spin to win today.